Two words that are synonymous with family fun and they are “GREAT ADVENTURE”. 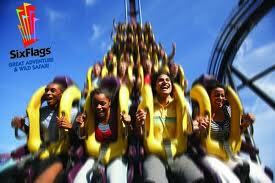 That is Six Flags Great Adventure in Jackson, New Jersey. My husband and I decided to take our two kids there a few days ago for some fun and excitement. We all had a great time and I would like to share some of my tips and tricks that we used in planning this trip. First off you have to check the weather out and make sure that no rain showers or thunderstorms are in the forecast. A majority of the rides and attractions are outdoors so this is very important. The second part of the planning is to book a hotel/motel close to the park. There is a list of accommodations on the Great Adventure website. We compiled a list from those provided. My husband then went to each hotels individual website, punched in the dates and searched for the best rates. At the same time he also entered the hotels into a few major travel search engines. (Booking.com, travelocity.com, expedia.com, priceline.com and trip advisor.com) Trip advisor is great because they not only send out your search to all the major travel sites they also provide great reviews for the accommodations. After searching for a few minutes my husband found out that the Days Inn in East Windsor had the cheapest rate if he used our AAA motor club card. They also offered a $1 trial membership in a travel service. Just for signing up we would receive $30 back on our stay. So after all the discounts we ended up paying only $70 for a room with 2 double beds. The Days Inn had an outdoor pool (which was a little dirty) and a free Continental breakfast buffet. That was great. 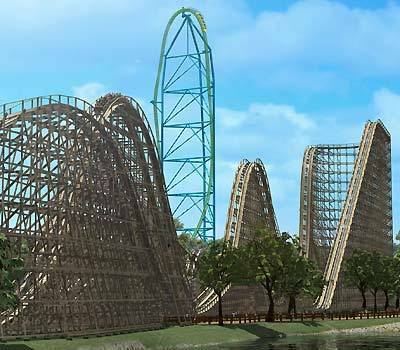 After my husband booked the hotel he decided to see if he could get cheap tickets to SixFlags Great Adventure. He first searched on their website and found out if you purchase the tickets more than 3 days in advance you would see your best savings. Since we were leaving that day this option was not possible. He then found a coupon code on another website that provided children pricing for everyone. So instead of paying $61.99 each if we bought the tickets at the park we would be paying $39.99 each, plus the $22 parking charge and the $5 web surcharge. Still we would be saving money. My husband then thought why not check out AAA’s website to see if they offered discount tickets. He found some links but was confused so he gave them a call. They told him that he would have to pick up the physical tickets at an AAA office. This didn’t sound like it would fit into our schedule. So my husband preserved and checked out the NY AAA website. There he found out you can purchase the tickets and print them out and use them at the park. We ended up paying $39.99 for each ticket and there was no $5 dollar web charge. Fantastic!!! Ok so we go the tickets and booked the hotel. While he was making that arrangement I had already gone ahead and packed up the kids and myself. We were out of the house by Thursday 3pm and ended up making it to the hotel by 5pm. Not bad considering we had to drive through Manhattan and we made 1 pit stop along the way. Ok, all right I am going to skip to the good part, Great Adventure. We got to the park Friday morning, between 1030-1100 am. When we arrived there were hundreds of kids getting off school buses. I guess they were there for end of the year school trips. There was a big line at the entrance for the metal detectors. It is pretty sad that we need metal detectors to keep us safe at theme parks. After that unpleasant delay we got through the next line pretty quickly. The attendants scanned our printed tickets and we got inside. We were considering purchasing the speed passes since the crowds looked pretty big, but decided against that when we saw the pricing. $90 for 1 Flash pass! Are they CRAZY! 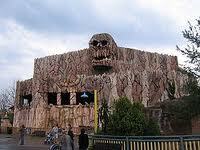 We then moved quickly to get onto our first roller coaster, which was Skull Mountain. Upon the reaching the line the attendant said that I could not bring my bag into the line. I told her that on previous visits we would leave the bad in the cubbyholes right by the ride. She said that they changed their policy and we now had to use the lockers. There were lockers right by there and they charge $1. The sign said they were only to be used while you are on this ride and were good for only 2 hours. Well there was no line for this ride and we decided to leave our stuff in there for the full 2 hours. We then went on several other rides and coasters before removing our items and then taking the air lift to the other part of the park. I was dying to go on my favorite roller coaster “El Toro”. But first we had to do some family friendly rides. My daughter is too short to go on the big roller coasters and my son was too scared. My husband wanted to go on some of the big coasters so we didn’t know what to do. Anyway we rode the “Runaway Train” coaster, which my kids and husband really enjoyed. After that I hit “El Toro” and was not let down by its twist and turns. I think this is one of the best roller coasters I have ever been on. After this we went on several more rides, ate some lunch and then tried to figure out a way that we could both ride the coasters without having to wait on line twice. One of the attendants told us there was a family pass that we could get. It is free and it allows one parent to ride while the other waits standby with the kids. So my husband went on the Superman Coaster while I stood by with the kids. When he returned I went right on the ride while he then waited with the kids. This worked out great and allowed us to both enjoy ourselves without making the kids suffer too much. Anyway, all and all the trip to Great Adventure was well planned and worked out great. The lines went quickly and we really didn’t even need the speed pass. We only wish the park stayed open a little bit longer so we could have ridden one more time on the “Log Flume”. What are your family’s favorite theme parks? Tell us below with any tips or tricks you would like to share. « Contour Ab Belt Review. Does it REALLY work?